We told you last on 12th June that Toyota could launch the Camry Hybrid in India (Refer source here), the Japanese car maker has launched the car in India at Rs 29.75 Lakh. Don't just get carried away by the pricing, just take a deep dive into the car - how it operates and how is it different from our regular cars, and we are sure you would cry like a small child to own one ! Hybrid vehicles are propelled by two or more power sources where the power can be generated and output used for driving the car. 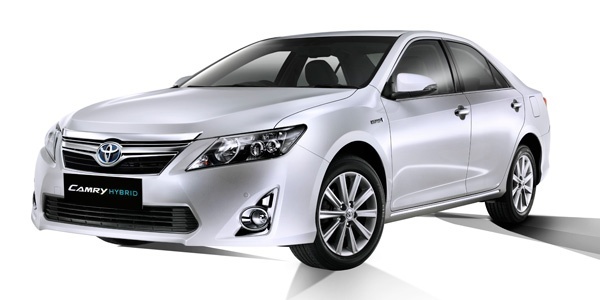 In case of Camry Hybrid, it uses a 2.5L VVT-i Petrol engine along with an Electric Motor. The regular Camry uses a 2.5L "Dual" VVT-i Petrol engine, however in case of Hybrid it uses VVT-i only for intake valves. The Camry Hybrid runs on Atkinson cycle than the regular Otto cycle. Atkinson cycle delivers more fuel efficiency, ARAI certified 19.16 Kmpl for Camry Hybrid though compromising the power and torque figures. Torque is down to 213 N-m from regular 233 N-m and power figures are down to 158 bhp than regular 179 bhp. However, the fall in power is compensated by the electric motor that produces 141 bhp at 270 N-m of torque. However, to limit your excitation levels, let us clarify the total maximum torque is not the sum of two rather upto the max. upper limits of 202 N-m. The extra power isn't felt - thanks to the 150 Kg of batteries placed on the rear (boot) of the car. The battery is an Ni-MH unit with a capacity of 6.5 Ah comprising 34 modules and 206 cells. 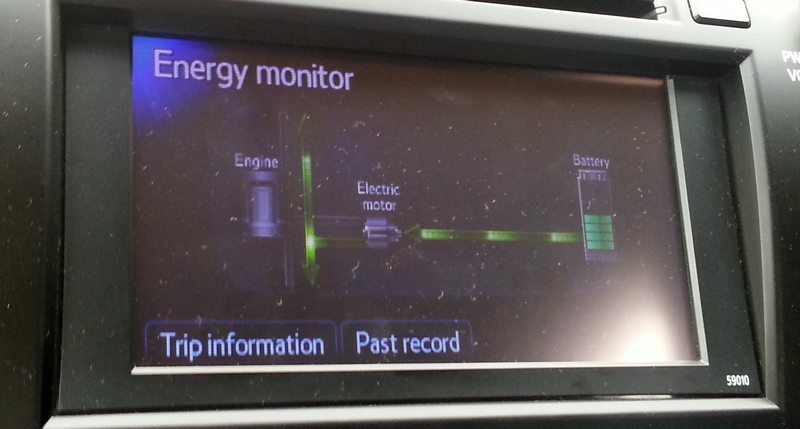 Camry Hybrid Energy Monitor showing Petrol engine powering the Electric engine. CamryHybrid showing the fully run Electric engine. On the front and the rear, you get Toyota badge with blue tint at the back denoting the Hybrid system. Even the dials get the blue colored tint, once you enter the car you can also see the Power switch (to get your car into life) with blue backlit lights. You press the button and you don't get even a noise of the whistle, it's completely electric and No noise ! All you need to do after that is slot the gear lever into D and you're all set. However, it you press the accelerator hard, you call the petrol engine which will come rushing to your car and get you zoom across. Also if you are on highways, once you set behind speed of 60 Kmph, the Petrol engine comes to life. Else the Petrol engine comes to life in case they are out of charge. 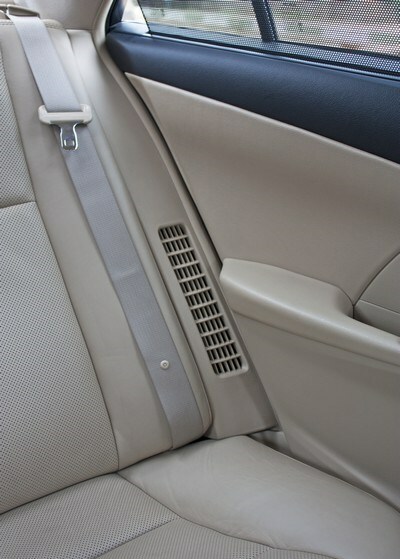 The Rear bench vents - used to pass air conditioned air to the boot of the car which hoses the Ni-MH battery. The Electric car comes with 3 different modes - ECO, EV and ECO OFF. The Eco mode is for normal driving within the city. In ECO mode, the Hybrid system tries to minimize the use of the petrol engine, ofcourse you have to be patient and gentle to your accelerator pedal. The fuel-efficiency in ECO Mode will be highly optimised. The Camry Hybrid's ARAI rating of 19.16 kpl is higher than small hatchbacks like the WagonR (18.9 kpl) and the Swift (18.6 kpl). The EV mode tries to use Electric batteries as much as possible. 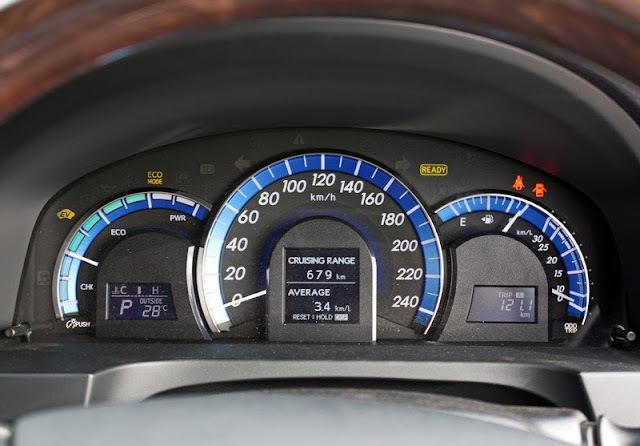 As soon as you drive above 40 Kmph, it turns back to ECO mode. 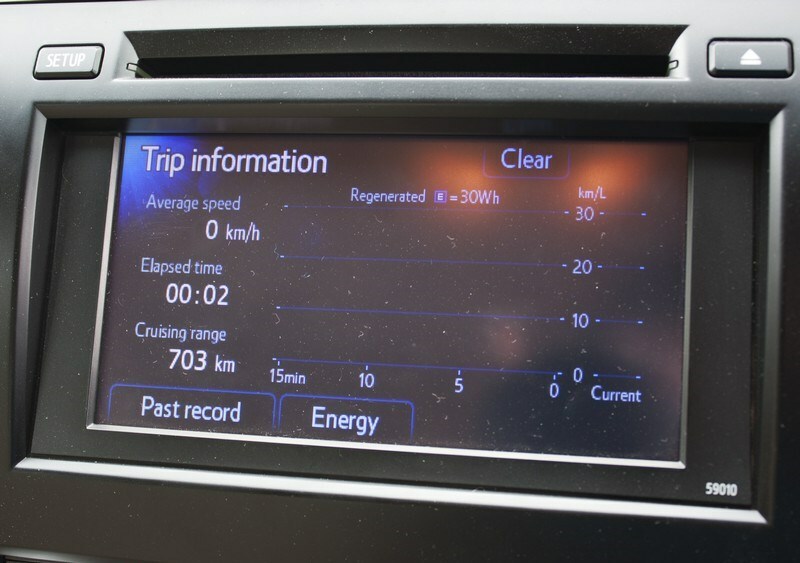 For EV mode, the fuel consumption is effectively zero as it is using Electric mode for most of the time. The ECO Off mode works like a sports mode. 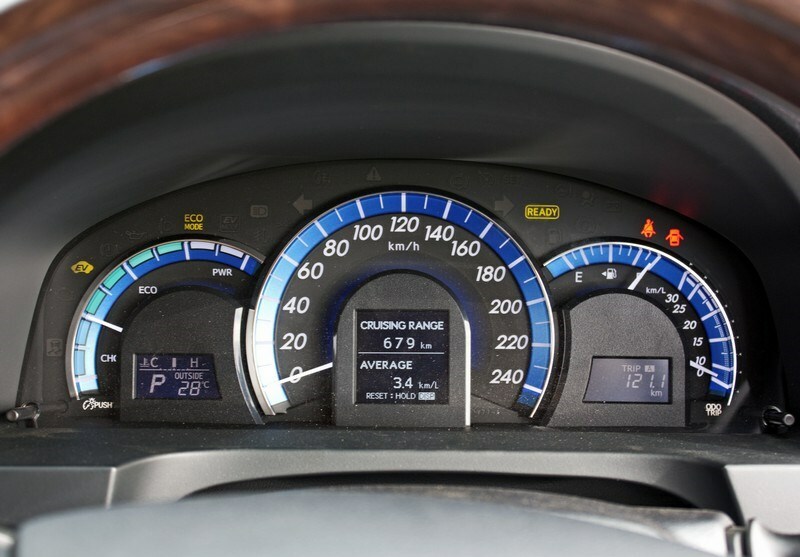 As soon as you turn off the Eco mode, the accelerator gets light and asks you for more ! This is a good mode to be in when you are in a hurry, or on single-lane highways which require you to overtake from the other side. You can literally reach triple digits of speed in no time. The Eco off mode will give you the lowest fuel efficiency as you are engaging petrol engine along with the electric motor. The Braking unit in Camry Hybrid is the most complex one and uses the regular 17" wheels equipped with disc brakes along with regenerative braking. In regular cars, the heat energy generated by friction caused due to an effort of stopping the car is literally wasted. In this, a regenerative braking is used wherein it stores the heat energy and uses it for charging your electric motor. So, regenerative braking comes into effect whenever you press the brake pedal lightly, as soon as you press it hard, the regular disc brakes come into life. 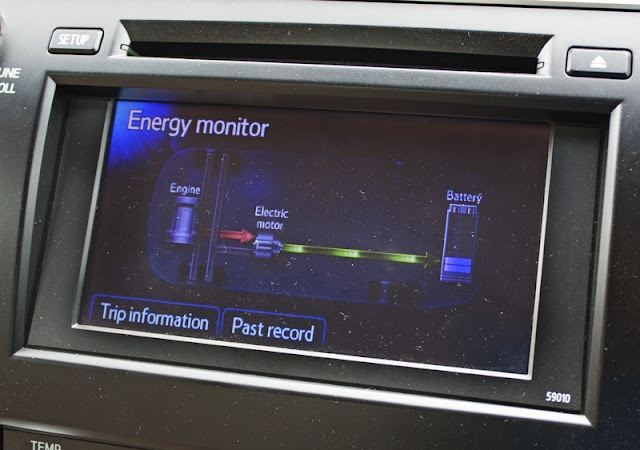 The Camry Hybrid displays how much energy has been generated using Regenerative braking. Low CO2 emissions of 122.8 gm/km is comparable to 1.2L petrol hatchbacks! 3 year / 100,000 kms standard warranty. No extended option. A new Metallic Grey paint shade has been introduced. This is unique to the Hybrid. When you engage reverse gear, the rear sun-blind rolls down automatically. The ORVMs tilt down as well. The wooden inserts on the dash are dark brown on the Hybrid vs the reddish wood of the regular Camry. We have a lot of say about Camry Hybrid, and the space is less. In case you have any queries, just shoot across !